Costa Coffee is the fastest growing coffee shop business in the UK and proud to have been voted the UK’s favourite coffee shop for eight years running* . Members of the Costa Coffee Club are rewarded for their loyalty with points and enjoy benefits such as free treats and exclusive offers. With millions of transactions daily, it was clear that the ‘Coffee Club’ data held massive power and even small shifts in loyalty have a massive impact. Costa Coffee knew that there had to be a faster, more intelligent approach to understanding who to reward and when. We were asked to help improve customer retention, reduce churn and to maximise the potential of the Coffee Club. The starting point was to bring the data together for the very first time into a unified view. This view was incredibly extensive and included transaction history, purchased items, location, ‘eating in’ versus ‘takeaway’, club points, redemptions, registrations and store data, email history, plus many other powerful pieces of data. By going “back in time”, we were able to gain a greater understanding of the ‘Coffee Club’ members and how their data could predict future behaviour, by comparing customer data over the last 3, 6 and 12 months. However, we found even more predictive power hiding in the depths of the data, it was these findings that enabled us to develop a fresh modelling approach to predict future customer value with far greater accuracy. The approach identified customers who had the potential to increase their value, as well as those at risk of attrition. It meant we were able to find ‘at risk’ pockets within all of the broad traditional RFV groups, unlocking a more accurate way of targeting by potential – getting the right rewards to the right customers at the right time. As is always the way with data, we found some truly fascinating insights along the way that have transformed the understanding of customer behaviour. For example, we discovered that new customers whose first transaction was before 9am went on to generate the highest value. 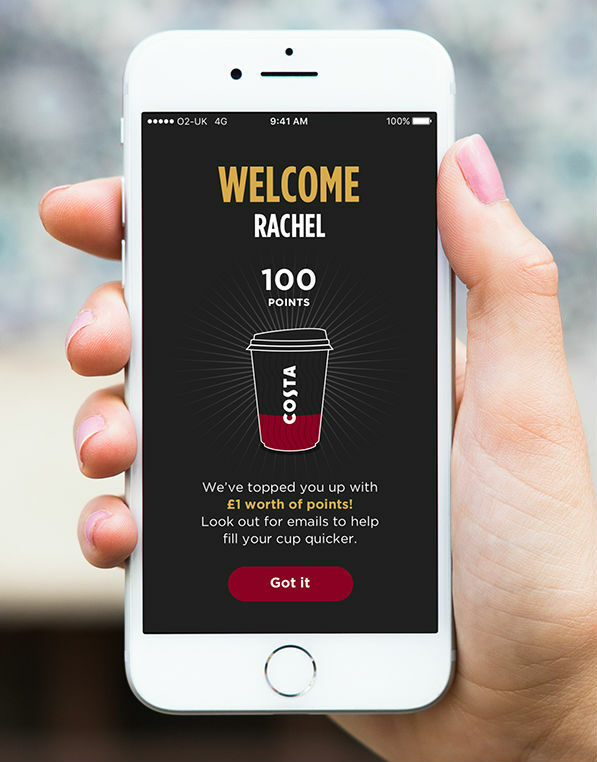 This was just one of the many powerful data points that would help Costa Coffee to personalise and optimise their reward based communications. Opportunities were mapped and prioritised against each segment. For example, retaining high value customers would have a massive positive impact on results. So in their next campaign, Costa Coffee set about targeting these high value ‘at risk’ customers with early win-back offers including a tailored reward. The greater insight into the data combined with a clear marketing communications strategy generated an increase of 40% in incremental spend. Targeting of high value ‘at risk’ customers drove 35% of this campaign’s incremental. The segmentation now forms the bedrock of an ongoing customer-centric strategy that delivers a far greater ROI. Could your data be hiding extra power too? …Perhaps over a Costa coffee? * having been awarded “Best Branded Coffee Shop Chain in the UK and Ireland” by Allegra Strategies for eight years running (2010, 2011, 2012, 2013, 2014, 2015, 2016 & 2017). "The greater insight into the data combined with a clear marketing communications strategy generated an increase of 40% in incremental spend"